Is your Nintendo DS Lite starting to look a bit worse for wear, or maybe you have damaged your current casing on your DS? 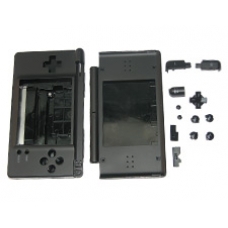 If so, then Nintendo DS repair and parts stock full replacement case sets for the Nintendo DS. The set includes the full replacement case, a stylus, battery door cover, a slot 2 filler card, replacement buttons, rubber pads and screws. This replacement case is also ideal if you have broken the hinge on your current console. * Gloss Black Outer Case with Matt Black Inner Case. * Includes Replacement Buttons, Screws and Stylus.